Produced with the assistance of Eureka Software as a project in the College of Art and Architecture's Advanced Interface Design course. Contains: video about the campus, the complete UI catalog, application forms, scholarship information and the enhanced capability of connecting the user to the U of I web site. 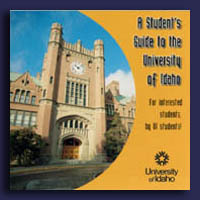 For more information about the university visit the University of Idaho Web Site.